Remove outer leaves of cabbage. Shred cabbage into desired length. You can use a food processor or by hand. Add salt and toss with cabbage to combine evenly. Pack cabbage into a gallon jug with a clamp down lid or an airlock or canning jar. Leave 2 to 3 inches for kraut to expand. Set in a cool place, out of sunlight for 6 to 7 days. After 6 days place in the refrigerator. They will last at least 9 months or longer in your fridge. 16 Responses to "Cultured Vegetables Without a Culture"
I have been making your sauerkraut recipes for a couple of years. I have a funny story. I had run out of cultured foods and my immune system was down. I woke up one day with itchy eyes. It may have been allergies or it may have been conjunctivitis. I had this once before and I thought that the good probiotics from cultured foods might help, so I put my homemade sauerkraut juice on cotton balls. Then I closed my eyes and put the cotton balls on my eyelids. The relief was incredible. In a matter of minutes the itch was gone and it lasted all day. I applied this twice a day for two days and my eyes cleared up. Well, this time I was out of my homemade sauerkraut. I had some sauerkraut from the store and did the same treatment. It didn’t work; in fact it made it worse. Then I noticed I had a small jar of year-old sauerkraut in the back of the fridge. I put the sauerkraut juice on the cotton balls and laid down with the cotton balls on my eyelids. It was that same blessed relief. I have been told that Boric acid will work, but I trust the sauerkraut juice. 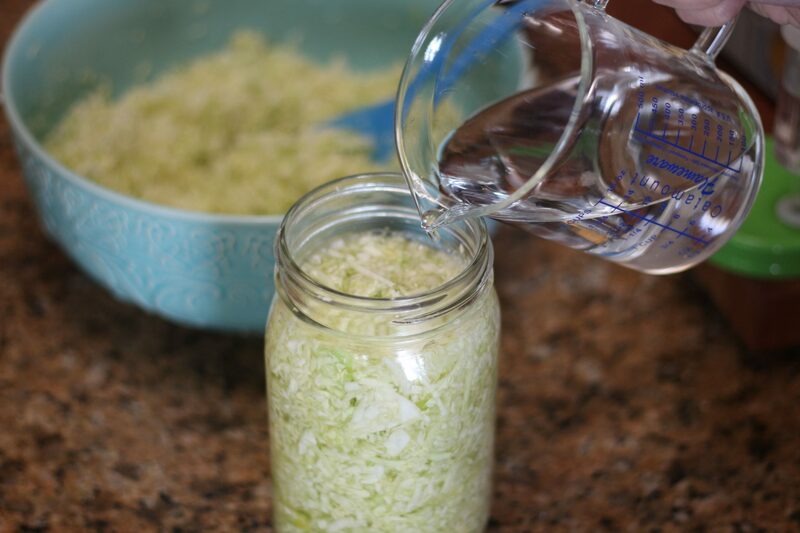 You could probably make a sauerkraut solution by mixing it with filtered water to test how you react. Apply a little to the skin on your arm as a test. Sauerkraut leaves may work as well, but I haven’t tried using these cultured leaves. I wonder if this will work on skin conditions such as acne or eczema. I’ve never done a sauerkraut facial. This treatment again proves the health of sauerkraut. Don’t let the drug companies know; this will be a reason to take away our sauerkraut! I’m also in the UK, tried to find the website ‘wisechoicemarkets.com’, but get a message that it’s unavailable. I have been making, actually attempting, to make Sauerkraut over the past year with less that fair results. I have not used culture but have done it by pounding the cabbage to release the water and per your above recipe by adding tap water from my well. It never seems to get a real sauerkraut taste or good and sour like I buy, ie Bubbies. I also always get yeast and sometimes mold no matter what I do. Wish you would come to Maine. We have a great health food store in Waterville with a good following from Bangor to Augusta. I’m thinking David that it may be your water has a strong mineral content, or that pounding the cabbage is rupturing the cell membranes which may be changing the process. Try a small batch with water from a different source with pounded cabbage, and one with your well water and finely sliced cabbage and see what happens. Thanks for the info Heather. I was not using any water when pounding as the salt and pounding draws the water out of the cabbage. When I tried no pounding and all water that it went really bad but I have not tried bottled or distilled water. I am now getting great results by using a similar method to Charissa’s below. I put it all in a bowl, add the salt and then squeeze it with my hands to bring some of the water out. I then put it into a wide mouth canning jar (one or two quart), press it down and add water as needed. Hi David. I had the same problem with my sauerkraut. It was so mushy that I did not like it (but the dogs do). The last time I made it, instead of smashing the cabbage, I sprinkled the salt over and then mixed it with my hands. Then I pushed it tight into a wide mouthed jar. I covered it with water, leaving space at the top. Then I weighted it down with a couple of big rocks and put the lid on. I let it sit on the counter for six days. It finally turned out crunchy! Next time, I will ferment it longer to see if I can get it to taste similar to Bubbies. I would also like to try some different varieties of cabbage. Some taste better in sauerkraut than others. Good luck. Hey Charissa, thanks for your reply. I have probably wasted 50 pounds of cabbage doing this. It is crunchy but never seems to get a real “kraut” taste. I do however have great results with sliced carrots and eat them like candy they are so good. My next project is soy yogurt as i make my own soy milk. What perfect timing for your email. I just bought a cabbage from the green market yesterday. I tried making sauerkraut a few weeks ago for the first time and it was a disaster. It smelled like sauerkraut but the liquid was all slimy. For some reason I covered it with a paper towel. I guess the recipe I used wasn’t clear like yours is. I need to try it again and will with your recipe. Thanks!!! I live in England and we cannot buy the starter cultures you buy, will just be just as good if I don’t use a starter, or could I use probiotics from a probiotic tablet. It’s better to use a starter and you can purchase them at wisechoicemarkets.com for the UK. I just tried typing the wise choice markets web address into my browser (I’m also in the UK) and it keeps telling me that there is a problem loading the page. Is the website still active? Yes it is active I just talked with them and maybe its a problem with the server? I am also from the UK. Amazon sell starter cultures, I have used them to make kefir successfully maybe it will work for this. There is a wisechoicemarket.com in the USA. That may ship to the UK. Is that what you meant Donna? http://www.wisechoicemarket.com/ is in Canada and they ship overseas.